Good People: Meet Kay Clark, Independent Living Nurse/Nurse Manager - Grace Ridge Retirement Community - Morganton, N.C.
As Grace Ridge celebrates 30 years of good moods, good times and good life, we are shining the spotlight on the people who make up the heart of the community: our dedicated and compassionate employees. Today we highlight Kay Clark, an Independent Living Nurse and Nurse Manager who has worked at Grace Ridge for nearly 27 years. In fact, she worked at our community before it was known as Grace Ridge. 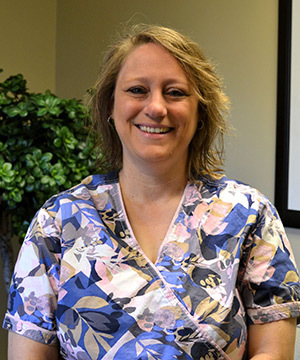 It was Mountain House when she started as a certified nursing assistant back in 1990. Kay took a break for a year in 1994 to finish her nursing degree. Then, she came back as a registered nurse working with independent living residents. Kay has worked as a floor nurse, nursing manager and interim director of nursing. Kay feels that there is not one best part of her job; there are many best parts. She says that the residents, and their families and her teammates, are the reasons why she loves working at Grace Ridge. She especially enjoys getting to spend one-on-one time with the residents and getting to know them. In her free time, Kay enjoys riding motorcycles with her husband and family. Thank you, Kay, and all of Grace Ridge’s outstanding employees!